The SW Idaho Chapter of the National Association of Residential Property Managers (NARPM) just published their 1st quarter rental rate and vacancy report. As we have reported before, this survey information is a good guide to follow trends. The sample size this quarter is a little low and First Rate Property Management believes that it could result in skewing some of the reports. None the less, it is safe to say that the Boise area rental market continues to remain very strong. Vacancy: We believe that the vacancy percentages reported are representative of the market. 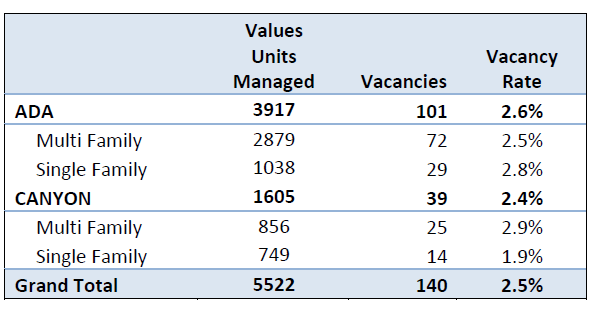 We assume that most companies are experiencing lower vacancies, like FRPM, and these numbers are a bit higher due to higher vacancy with companies taking on many of the newly built properties during the initial rent-up period. On page two is a line graph that is not properly labeled. 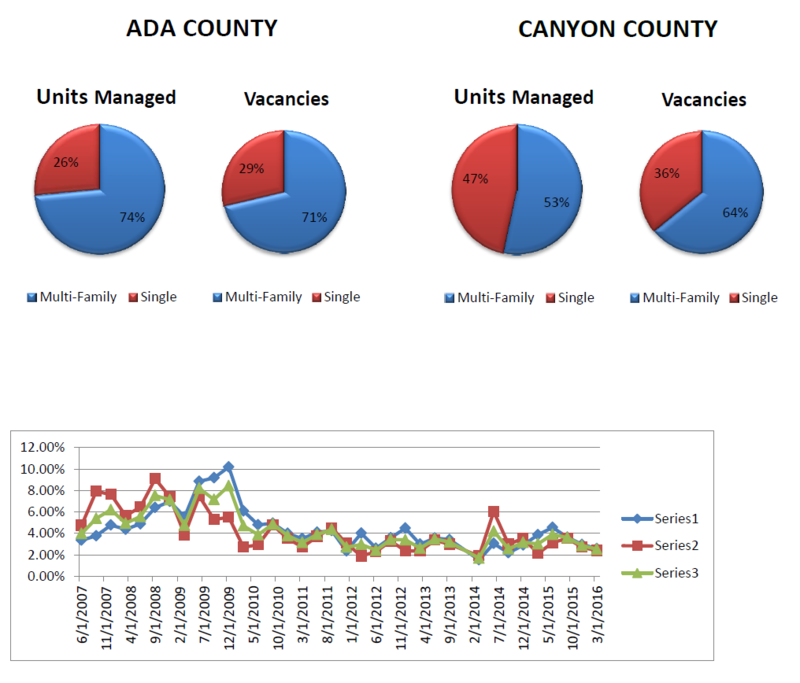 Series1 (blue) represents multifamily rentals, Series 2 (red) represents single family home vacancies, and Series 3(green) represent the combined or overall vacancy in both Ada and Canyon Counties. Multi-family rents: This is where we believe that the small sample size is really showing the skewed numbers. As you see, based on the data, NARPM is showing average rents to be higher in Canyon County for both 1 and 2 bedroom units. Perhaps that is true, as these numbers only represent the average rent for vacant units but Ada County rents have always been stronger than Canyon County. Additionally, the averages are much higher than market rents and we assume that is because of the vacant new construction is renting at much higher rent levels due to their upgraded finishes. Single family rents: Here we see the typical spread in average rents between the Boise area versus Canyon County. Notice there were no reported vacant two bedroom single family homes in Canyon County. The average 4 bedroom rental home within the Boise area seems a bit high, but perhaps reflected of some higher end homes. The 2 and 3 bedroom homes rent averages seem inline to what FRPM is seeing in the market. The purpose of this survey is to show vacancy and rental rate trends among single-family homes and multi-family units (2-15) in Ada and Canyon County. Survey results are displayed by type (single or multi-family) and bedrooms (1-5) for the respective county. Property status was surveyed for the 1st quarter of 2016. Data from a total of 13 property management companies were included in the survey results, which accounted for a total of 5522 homes: 1787 single-family and 3735 multi-family. The accuracy and reliability of this survey is improved with an increased sampling. Vacancy rates moved down slightly again to 2.6% for the 1st Quarter of 2016. This is a decrease of .3% from last quarter. The largest decrease in vacancy rates from last quarter was single family homes in Canyon County at 2.10%. Ada county single family had an increase of .6%. Rental rates in Ada County increased on the average of $273 for single family homes. 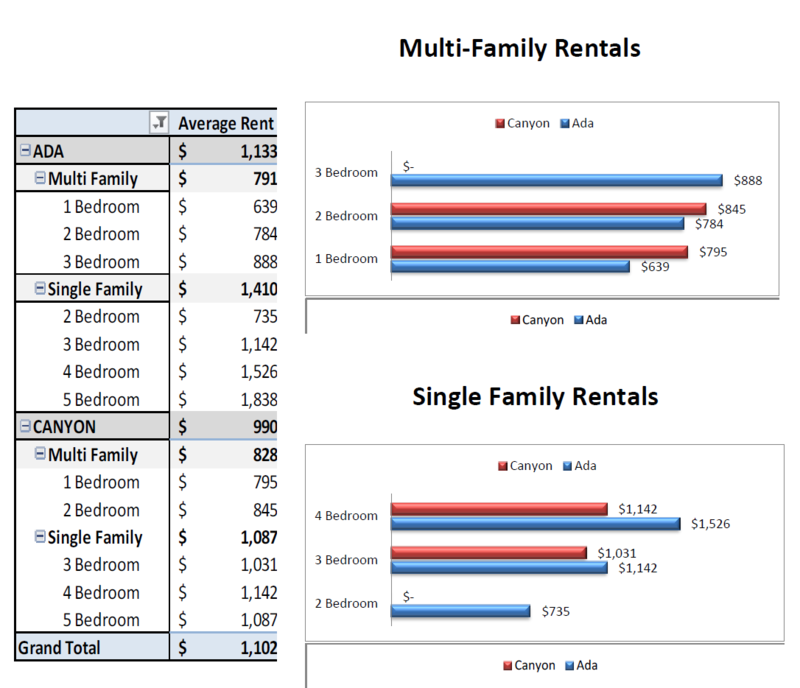 There was an overall increase of $101 in rental rates for multi-family homes, in Ada County. On the average Ada County showed a $198 increase in rental rates over last quarter. This large increase is based on the demand for inventory and the time of year. Both Ada and Canyon County experienced vacancy increases for the 1st Quarter in 2016 starting the year off on a very high note. Although both counties experienced the vacancy increase, Canyon County had the higher increase in vacancy rates by 22% last quarter. We thank you for participating in this survey. Please educate more Professional Members about the importance of this survey. More participants in these surveys is the only way to provide the accuracy and reliability information for our local market.